← ANTHONY PUN. History of multiculturalism: Part 1 – Early development – Chinese Australian community involvement and Chinese students. ANDREW GLIKSON. Human cognitive dissonance and the mass extinction of species. The history of Earth is marked by at least seven major mass extinctions, including asteroid impact effects 580 million years ago, the end Ordovician glaciation, late Devonian asteroid impacts, end-Permian volcanism and ocean anoxia, end-Jurassic volcanism and Cretaceous-Tertiary asteroid impact—mostly associated with an extreme rise in atmospheric CO2. 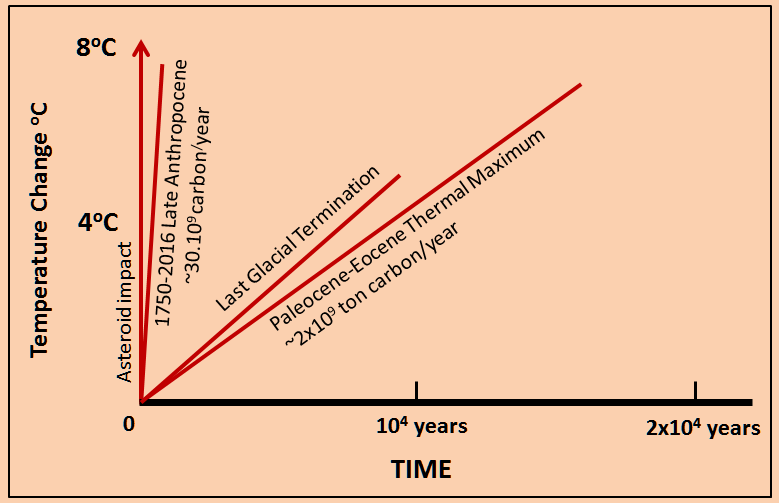 Currently the seventh mass extinction of species is taking place, mainly as a consequence of CO2 rise at a rate close to that induced by an asteroid impact (Figure 1). The Seventh mass extinction is triggered by a species which harnessed transfer of carbon from the Earth’s crust to the atmosphere and has split the atom, but is failing to control the consequences. Such is the scale and the rate of the unfolding climate catastrophe that, in the words of Joachim Schellnhuber, the EU’s chief climate scientist, it threatens the life support systems of the planet. 4 Responses to ANDREW GLIKSON. Human cognitive dissonance and the mass extinction of species. Too late at night to say more than “thanks” for your persistence in presenting this information, including the always useful graphics. There are people out here reading your stuff Andrew. It’s hard not to despair, but we have no choice but to keep trying. A thoroughly depressing read, as it should be considering the subject matter. And while the Industrial Age and our use of fossil fuels has been a major contributing factor, I think of it as being more a symptom of the disease. That disease being us. Overpopulation is the underlying cause of what will inevitably become the Seventh Extinction. What hope, as you say, can a 26, 50 or for that matter 100% reduction in emissions offer when this year approximately 140 million babies will be born but only 57 million will die. Daily the population increases by 200,000. The numbers are staggering. If you did nothing else but count, it would take almost 32 years to count to 1 billion. However the world population will increase by that number in the next 10 years. This ‘Us’ issue is a problem, more so than it’s symptom Climate Change, that politicians seem reticent to deal with, opting instead for sticking their collective heads in the sand and chanting a ‘jobs and growth’ mantra. b) Scomo will get his Rapture. Thank you, Andrew, for your c0nscience-prodding and honest evaluation of what we, collectively, are bringing down on our own heads and all future life forms. My heartfelt wish is that your calls for ethical change and consideration to preserve life as we know it on planet Earth are not just read here in John Menadue’s blog, but are broadcast to the widest possible public consciousness. Your “call to arms” is critical in this climate of mad consumerism and wilful blindness.